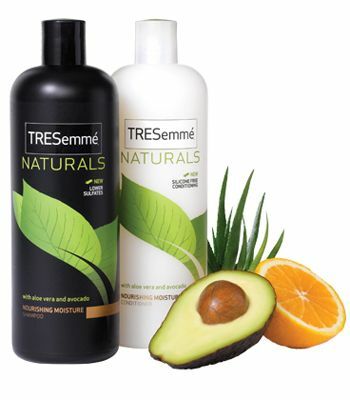 Tresemme is an affordable solution to using professional-grade styling products. I’ve been using Tresemme Flawless Curls Vitamin B1 Curl Moisturizing Shampoo & Conditioner for years and recently switched to their Tresemme Naturals Nourishing Moisture Shampoo & Conditioner with Aloe Vera and Avocado to find a soothing, manageable better alternative to clean hair that my stylist won’t complain about. While washing my hair, I found the product to lather up with big suds to cover every inch of my hair. A sweet but subtle scent of aloe fills the thick air, and my scalp is instantly soothed by the natural oils in the shampoo. Unlike Tresemme’s Flawless Curls Vitamin B1 Moisturizing Shampoo & Conditioner, its counterpart, Tresemme’s Naturals Nourishing Moisture Shampoo & Conditioner keeps your scalp from drying out and flaking with its USDA Certified Organic Aloe Vera and Avocado extracts. The oils also assist in taming flyaways and strengthening hair, which kept me from having to visit my hair stylist as often. I am a money-cruncher, as many in today’s economy can associate with, so the combination of saving money on visits to the salon and paying approximately $4 per bottle (shampoo and conditioner) every 4-6 months put money back in my pocket. Not only is this a great price for organic products, you can be sure it was not tested on animals. My hair was left feeling silky, soft, light (which doesn’t weigh down curls) and strong. On another note, Tresemme’s Naturals Nourishing Moisture Shampoo & Conditioner’s oils left my hair on the greasy side after a day. I am the type to wash my hair every other day, so this was a big turn-off about the product. Sulfate-Free, Silicone-Free hair products generally assist in cleaning off product buildup while keeping the natural oils of your hair in tact. Tresemme’s Naturals Nourishing Moisture Shampoo & Conditioner assisted in cleaning my hair if it was naturally styled, but when I used product, such as mousse and hair spray, in my hair when I blow-dry it curly, my hair felt heavy and sticky as though the product was still in my hair. Based on this analysis, I would have to say the idea that the product is salon-quality is not correct. Whether your hair is curly like mine or straight as a board, Tresemme’s Naturals Nourishing Moisture Shampoo & Conditioner is the right choice for anyone watching their budget and still needing to feel spoiled. I attempted to switch back to Tresemme’s Flawless Curls Vitamin B1 Moisturizing Shampoo & Conditioner, and I can strongly suggest you, as well as I, stick with Tresemme’s Naturals Nourishing Moisture Shampoo & Conditioner.